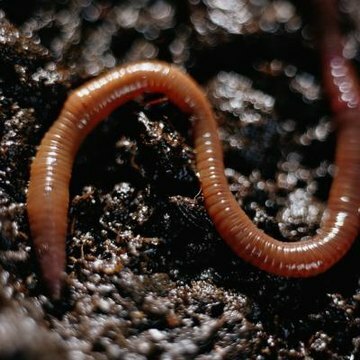 When you were out digging in your yard for your summer garden, you may have come across an earthworm -- or two or three. These wriggly creatures don't look too special, but they provide a host of benefits to the home gardener. They aerate and loosen soil, earning the nickname "nature's plow." Earthworms have ring-like segments along their bodies, called annuli, which are covered with small bristles used for moving and burrowing. Earthworms usually are about three or four inches in length, though some species may grow to over a foot long. There are more than 2,500 species of earthworms throughout the world and, generally, an earthworm can hope to live between 4 and 8 years. Though these crawlers have male and female reproductive organs, they require mating partners. After mating, sperm and egg cells are deposited in a cocoon, which is buried. It takes between 2 and 4 weeks for baby earthworms to emerge from their cocoon. Living a full life can be challenging for these guys, because they are food sources for birds, toads and rodents, and often are used for home composting, as well as commercial and recreational fishing.